Somehow, November also has become a big birthday month, so the celebrations have ensued! A little over week ago, Danelle graced me with the amazingness that is “The Count of Monte Cristo” movie, circa 2002. One of the main reasons that I loved this movie was its cast. First of all, the role of Albert is played by Henry Cavill, so he is just baby Superman and it’s wonderful. Second, the role of VIllefort is played by James Frain, who now plays Theo Galavan on “Gotham,” so he’s obviously just amazing at playing bad guys. Lastly, and most importantly, the role of Faria is played by the glorious Richard Harris, aka DUMBLEDORE, so obviously I was the happiest of campers watching this movie. Now, there was a reason we watched this movie, other than the fact that the cast was awesome. 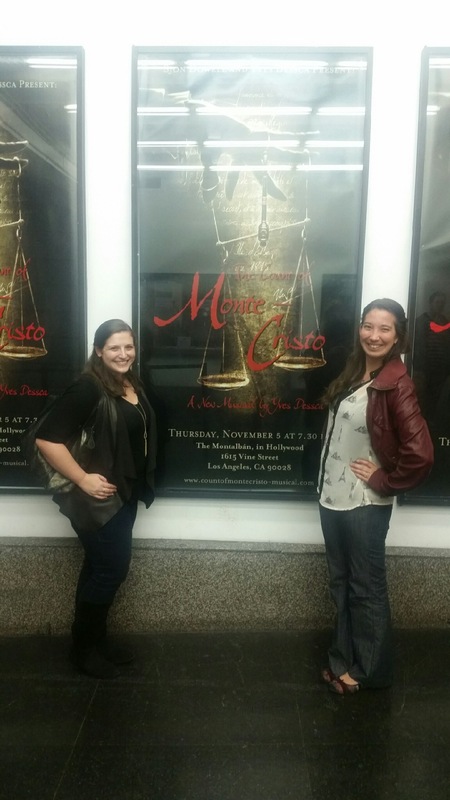 Danelle had requested that for her birthday, we see the preview of a new musical: “The Count of Monte Cristo” musical that would be showing at the Montalban Theater in Hollywood. And I was all in. Although I was born and raised in Los Angeles, LA’s public transportation is not something I think I’ve ever used (well, at least I don’t remember ever using it). But rather than be stuck in Hollywood during rush hour traffic, Danelle and I decided to take the Metro (LA’s subway) to get to the theater, and we documented this moment of being real Angelenos. It was actually not sketchy and relatively easy to navigate. I approve, and will definitely be using it again. We had given ourselves plenty of time to eat and wait for the show to start, and after doing our research, we stumbled upon “Blue Palms Brewhouse,” just a few blocks away from the theater. We walked in at around 6:15 and were immediately shown to a table. It was a bit like an upscale dive bar, and they have over 20 beers on tap. Just 15 minutes after we sat down it started to get crowded, so we were very impressed by our timing. Danelle ordered a rum and coke and I ordered a cider and we toasted to her early birthday celebration! To share, we ordered a side of the lobster mac and cheese, which had generous chunks of lobster meat and some mushrooms scattered throughout. Absolutely delicious, and large enough to be a meal on its own, even though it was just the half portion! For our main courses, Danelle got the BBQ Chicken sandwich and I ordered the Brewhouse Burger, which was just $8 on the happy hour menu and came with fries. The burger was classic and juicy, and a large portion for the price. We were both very satisfied with what we’d ordered, and we walked off the calories as we headed back to the theater. We picked up our tickets from the will call, and no less than 5 minutes later, the line wrapped around the door. Once again our timing was impeccable. We asked a nice stranger to take our photo next to the poster. He asked if we knew Yves Dessca, the director and writer of the musical. We said that we were just fans of the story. He said that he had known Yves for a while and that he had been working on the musical for years, trying to perfect it for the stage. There were some mishaps with the ticketing, so we were told to sit wherever we would like. As we were up on the balcony, we sat front and center. A nice girl named Amanda came and sat down next to us. She had a friend who would be playing a part in the show, and we chatted about our mutual love of musical theater, Disney, and Harry Potter. We immediately added each other as friends on Facebook. The show ended up starting about 15 minutes late, and we were so excited when the lights finally went down. Now, this was just the preview of the show, meaning it was the first time it was being performed in front of an audience. Overall, I thoroughly enjoyed this musical! The music was fantastic (live pit orchestras are always a nice touch), the story was good, and there were quite a few funny lines that kept me interested. My favorite line, and new life motto, is “Don’t fret and drink your wine.” There were some timing issues, and a few mistakes made a long the way, but I chalk that up to it being the first live performance. There were definitely some parts that could be shortened, but I’m sure that by the time this comes out officially, it will all be worked out. 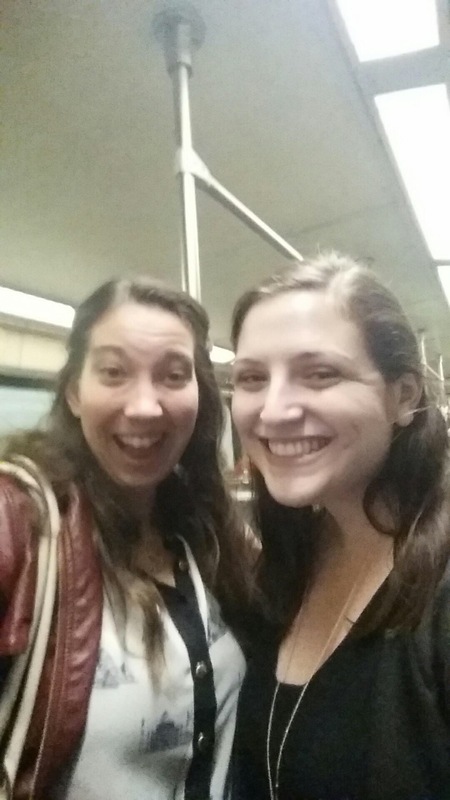 We hopped on the Metro and headed home after a very fun evening! Definitely glad we saw this show, and it made me remember how much I actually love going to the theater. Need to see some more shows soon!